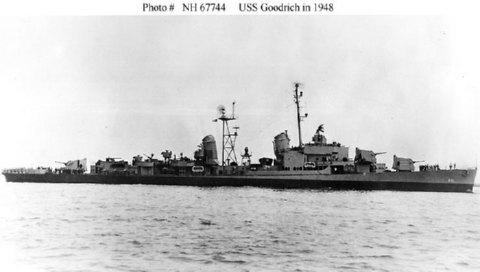 Goodrich (DD-831) was launched 25 February 1945 by the Bath Iron Works Co. Bath Maine; sponsored by Mrs. Caspar F. Goodrich widow of Admiral Goodrich and mother of Lt. Goodrich and commissioned 24 April 1945 Comdr. Dale R. Frankes in command. After shakedown training in the Caribbean Goodrich transited the Panama Canal 12 November 1945 to support the occupation of Japan. She patrolled between principal Japanese ports until October 1946; then she based at Tsingtao China for patrol along the coast of Korea. The destroyer returned to San Francisco 21 December 1946 and departed 7 January 1947 to base at Newport R.I. as a unit of the U.S. Atlantic Fleet. Goodrich overhauled in the New York Naval Shipyard then served in the Mediterranean Sea (2 February-22 May 1948). This was her first of many annual tours with the "steel gray stabilizers" of the 6th Fleet of actively countering the repeated threats of the Soviets to overrun the defenseless nations of the Balkans and the Middle East and exploit them for Red Imperialism. Her service included patrol along the Israeli-Egyptian border of the Red Sea in February 1956 to help stem the Mid-East crisis that Finally culminated in the nationalization of the Suez Canal. When fighting erupted she sped back to the Mediterranean in November 1956 to protect Americans in that area and serve notice that the United States was determined to contain and terminate the conflict. The destroyer supported the landing of Marines at Beirut Lebanon 14 July 1958 As the Navy again met and checked a Communist thrust against the Western democracies. Goodrich shifted her home port in June 1959 from Newport to Mayport Fla. Thereafter her annual deployments to the Mediterranean included intensive training in all forms of naval welfare with NATO units and a constant readiness with the 6th Fleet to meet any threat to peace in the Mediterranean region. She interrupted her schedule in January 1960 entering the Norfolk Navy Yard for an 8-month modernization overhaul which included complete renovation and latest weapons and shipboard equipment. She was on Project Mercury recovery station 12 February 1962 as Lieutenant Colonel John H. Glenn USMC made his successful orbital space flight. Goodrich went on alert again with the 6th Fleet during 24 October to 20 November 1962 when the Navy responded to President Kennedy's call for a quarantine of Cuba that choked off the flow of military supplies and enforced the American demands for the withdrawal of the Soviet missile experts and equipment. On 22 July 1966 the destroyer got underway from Mayport on her 13th 6th Fleet deployment. She cruised throughout the Mediterranean for 5 months unobtrusively patrolling with the 6th Fleet and taking part in combined naval warfare exercises with units of the Turkish Greek British and Italian Navies. She returned to Mayport 20 December 1966 for upkeep and type training.